"Jewish Pink Elephant" by Rich Dweck: "N.J. 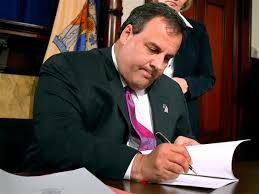 Governor Chris Christie responds to my email: Dear Mr. Dweck"
"N.J. Governor Chris Christie responds to my email: Dear Mr. Dweck"
Thank you for writing to express your support for Assembly Bill No. 3371, which would protect minors by prohibiting attempts to change sexual orientation. I appreciate hearing your views on this important issue. As you may know, I signed this legislation into law on August 19, 2013. I have stated in the past that I oppose conversion therapy but expressed my concerns about government limiting parental choice on the care and treatment of their own children. I still have those concerns and believe that government should tread carefully into this area. However, I also believe that on issues of medical treatment for children we must look to experts in the field to determine the relative risks and rewards. The American Psychological Association has found that efforts to change sexual orientation can pose critical health risks including, but not limited to, depression, substance abuse, social withdrawal, decreased self-esteem and suicidal thoughts. I believe that exposing children to these health risks without clear evidence of benefits that outweigh these serious risks is not appropriate. I hope you find this information helpful. Thank you again for writing and best wishes.